Finally, A Promising Robotech Game! Robotech (or, specifically, Macross) games have a chequered past. Some have been OK! Others terrible. Some have even been pretty good, though you wouldn't know it, since the best ones (on PS2 and PSP) have never been officially been released outside Japan. But anyway. Video games! This isn't a video game. 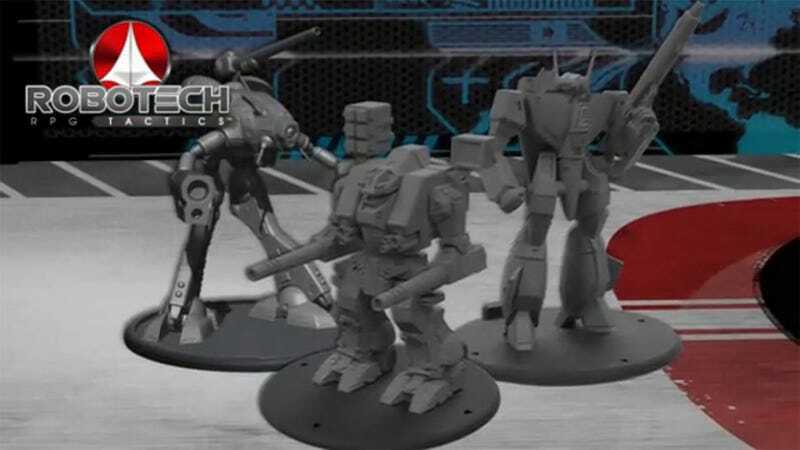 It's Robotech RPG Tactics, a tabletop game that you won't need to wait to be translated, because it's being made by a Western company (Palladium, the same people behind the classic Robotech pen-and-paper RPG). Despite its commercial backing, the project is actually up for bidding on Kickstarter. With a goal of $70,000. Which has been exceeded just slightly, with the tally at time of posting standing at just under $720,000. For those who don't play board/tabletop games, think of this as XCOM. Only you play it on a table, with friends, with amazing Macross pieces that look good enough to just sit on a shelf. So, yes, this could be the greatest game ever.